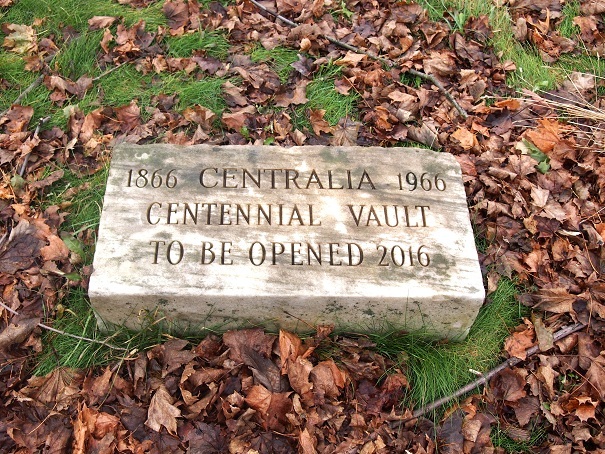 Click here to read about my first visit to Centralia. 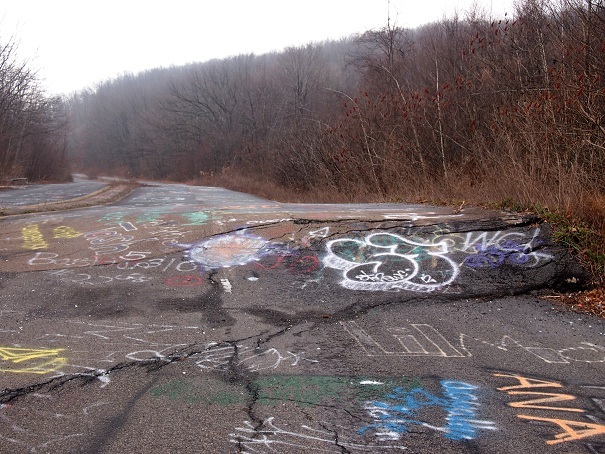 December 8, 2012 — Five and a half years ago, I visited Centralia, Pennsylvania. It was the early days of my OTIS adventure, back when I was still learning how to leave my living room and the big-screen tube TV I had splurged on at the expense of any other furniture in my apartment (and, almost, my apartment itself). It was my ninth post, just after the Dark Crystal Skeksis and right before the Cave of Kelpius. Since that time, a lot has happened to me. I moved to New England. Got a wife. A kid. A cancer. Published two books. Quit four jobs. Seen more fascinating things than a guy as ferociously suburban as myself deserves to. Meanwhile, Centralia kept burning. As it has for the past 50 years. As it will for the next couple of hundred. But I went and visited it again just a few days ago, just to make sure. 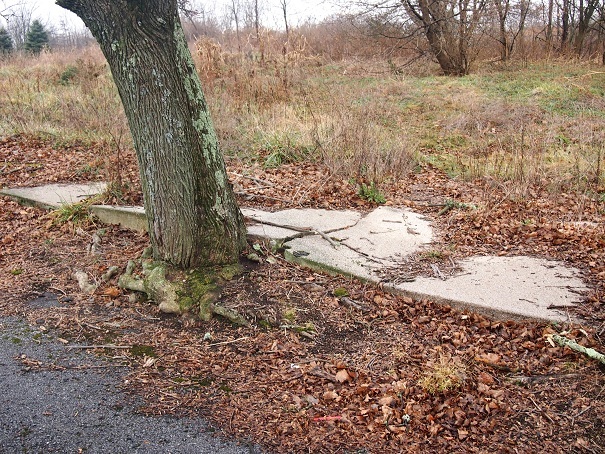 If you think of the shape of Pennsylvania—like I do and I assume the nearby Hershey’s candy company does—as a giant chocolate bar with a bite for an eastern border, then Centralia is located just 80 miles directly west of that bite mark. It was established in the mid-1800s, and, like many towns in the region, started out as a mining town. Anthracite coal was what it was built on then, and anthracite coal is what it burns on now. 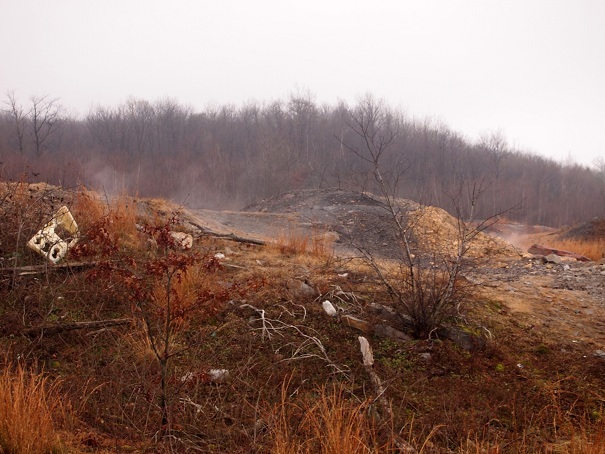 In 1962, a simple trash fire at the local dump ignited a bit of exposed coal that happened to be just the tip of the coalberg. It ignited a coal mass that stretched for miles beneath the town and the surrounding areas. The fire spread slowly and stealthily over the next couple of decades, until it became obvious that something was wrong. Really wrong. 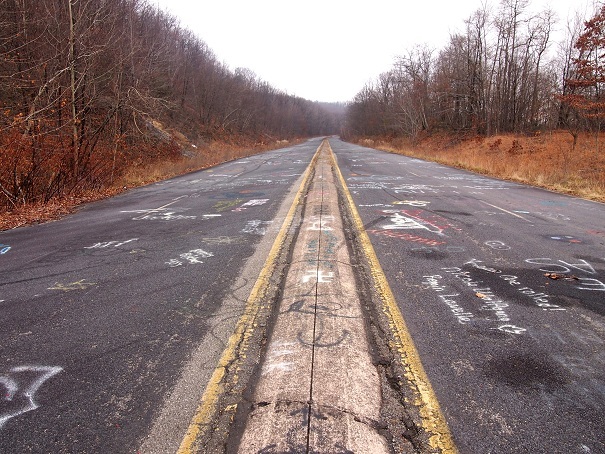 Hell had added a few more stories to its roof, and Centralia was in its way. After various futile attempts to put it out, Pennsylvania invoked eminent domain and evacuated and razed the town. They just let it go. Because you can’t live on top of fire, man. Scientists estimate that the massive underground conflagration will run out of fuel in maybe two more centuries or so. But nobody really knows for sure. 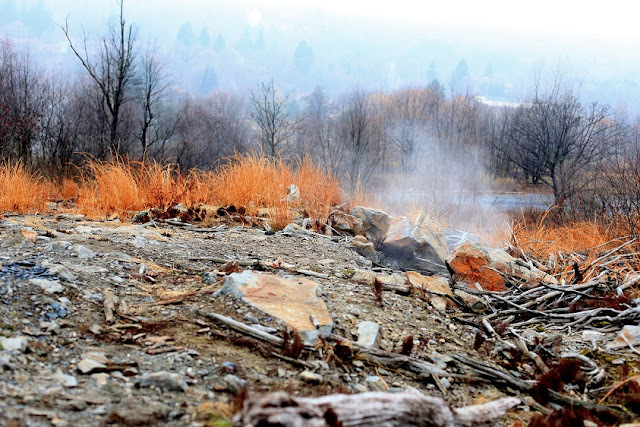 Short version: Centralia is a ghost town….on fire. Since that time it has gotten a reputation as a toxic horrorland full of winking sinkholes and carcinogenic clouds of death vapor. Honestly, though, it’s kind of the opposite. Heck, I took my wife and toddler to it this time. But even though it doesn’t live up to those extreme expectations, it’s still a fascinating, haunting place. 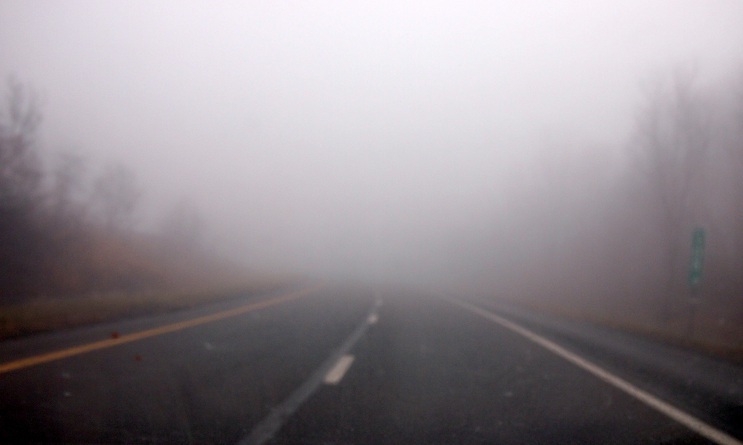 On my previous visit, the weather had been “sunny as Sesame Street,” but on the morning of my most recent jaunt it was foggy. Real foggy. Like Silent Hill foggy. Perfect. Except that somewhere about a mile outside of Centralia, it lifted, or we entered into a clear pocket or, most likely, we passed into another dimension, one where something as strange as Centralia can happen. The sky was ash gray and the December cold was untempered by the inferno below. 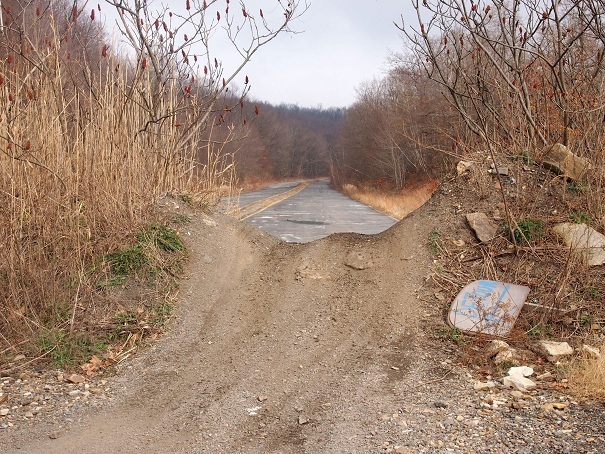 You get to Centralia by merely following Route 61. It cuts directly through what remains of the site. Takes you right downtown. Or, at least, what passes for a downtown for such a place. 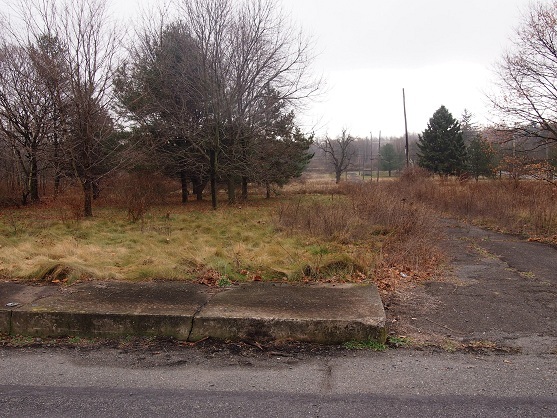 Centralia is pretty much just a grid of overgrown streets. Here and there along those streets you’ll see a bit of curb or a section of stone fence or an orphaned stretch of sidewalk, but mostly it’s just a field with some trees. People do still live there, though, and a couple of houses and a bland-looking municipal building can be found at points within and around that immediate grid. One of the houses, with its flat, windowless flank, looked to have originally been part of a row in those nostalgic days before tragic mine fires. The houses are lived in by holdouts from the evacuation who either disagreed with the consensus and bucked the government’s orders or like really warm basements. None of the places were dilapidated or abandoned-looking, as you’d expect. In fact, they wouldn’t stick out if they weren’t in the middle of a ghost town…on fire. So in that respect the place hadn’t changed in the past five and a half years. But I did get a little discombobulated when I couldn’t find the park area right away. On my previous visit, there had been a groomed section of grass with a veterans memorial in the shape of a large bell, a freshly painted bench proudly proclaiming the name of the town and the year of its establishment, and a stone block marking the location of a time capsule from 1966 that’s scheduled to be opened in 2016. It had all been across from another lonely ex-row house. 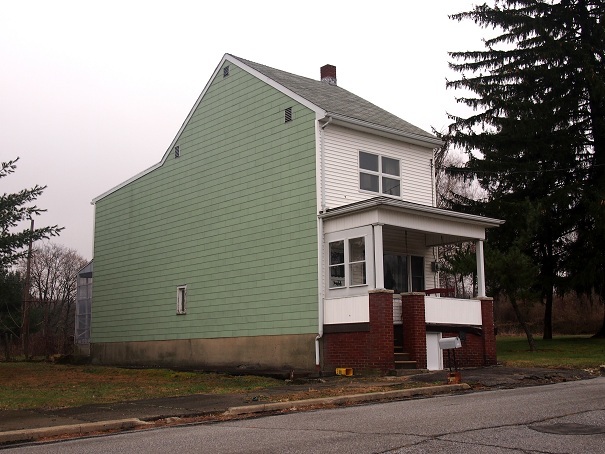 Eventually, I did find the stone marking the time capsule, but the bench was gone, as was the house across the street. 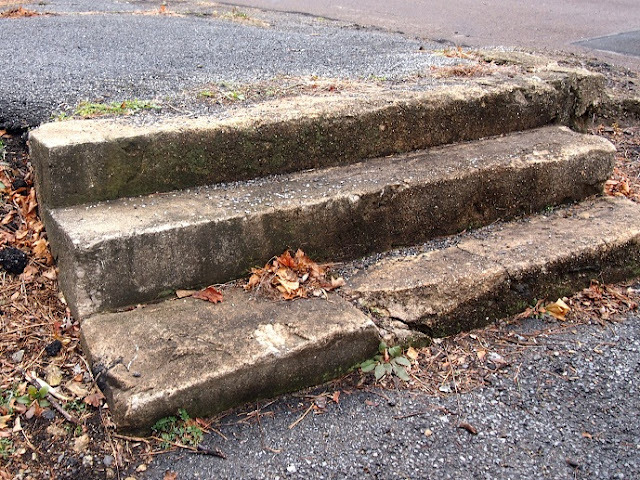 Not even a foundation stone was left for future archeologists. The veterans memorial had been reduced to a crumbling stack of cinderblocks, the bell nowhere to be seen. The whole tableau blended pretty well with the rest of the desolation. A small section of rusty chain-link fence lined by a couple of trees is the nearest landmark to it. More interesting than the streets is the adjacent area that looks like a landfill (and I mistakenly called it that in the previous article), but is just a small, hilly area of the town. Still, it’s your best chance of seeing smoke wafting ominously from the ground. Again, it’s right off Route 61, and you can pull in and park easily. 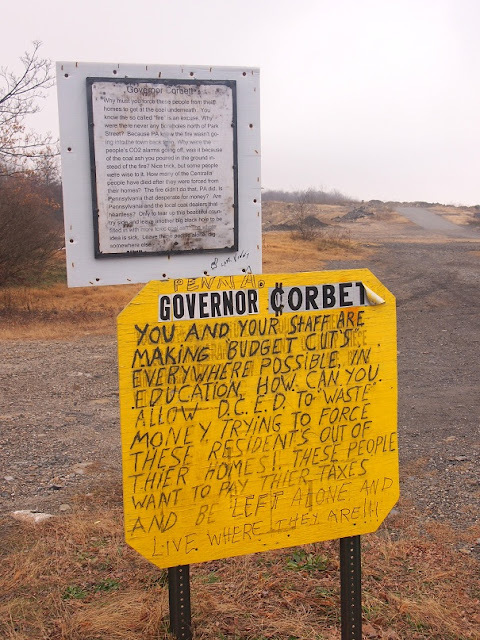 This time, a pair of homemade signs welcomed us to that part of the town…by excoriating the state governor for faking the fire to get rid of the town and gain access to the lucrative coal underneath. I don’t know if the A-Team ever had an episode like that, but it's exactly the kind of injustice that got B.A. Baracus so angry. From here, you get a good view of the surrounding environs, including a solitary church set on a hill on the far side of town that overlooks the devastation like it was God-sent. That’s St. Mary’s Ukrainian Catholic Church. It’s 100 years old, and from the scant mentions of it online, appears not to have been forsaken by God just yet. While we walked the black mounds of ash and dirt and scrub brush, the smoke wafted in small plumes like ghosts that blended into the slate sky. Due to the weather conditions, the smoke was more tenuous on this visit and sometimes we had to really focus [our cameras] to see it. But it was there, no doubt. The forever incense of a town sorry for its sins. Somebody bet me I wouldn’t write that line. I win. I think. 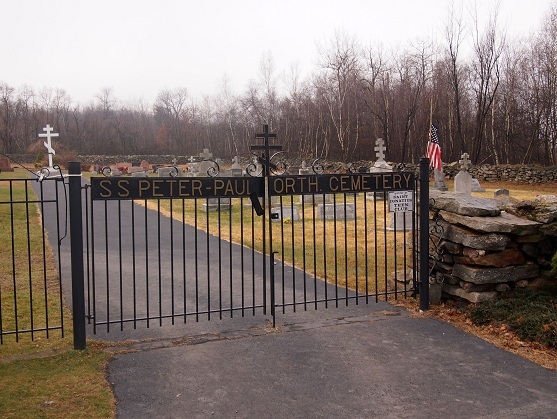 On the other side of this area are a pair of graveyards, the SS Peter and Paul Orthodox Cemetery and St. Ignatius Cemetery, each complete with, I assume, char-boiled corpses. 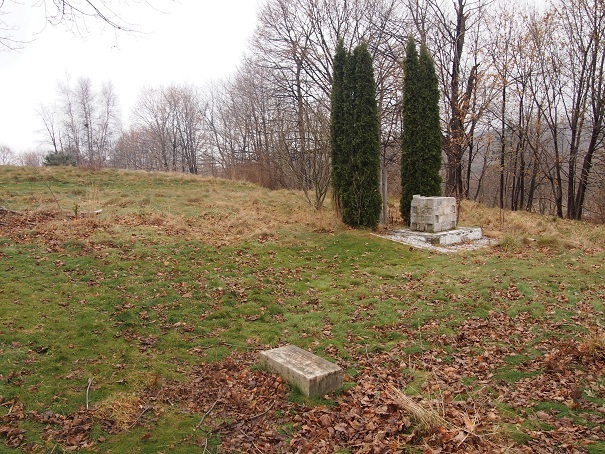 On the other side of Route 61 is a third graveyard, the Odd Fellows graveyard. It is near that graveyard where the landfill was that started this whole mess. 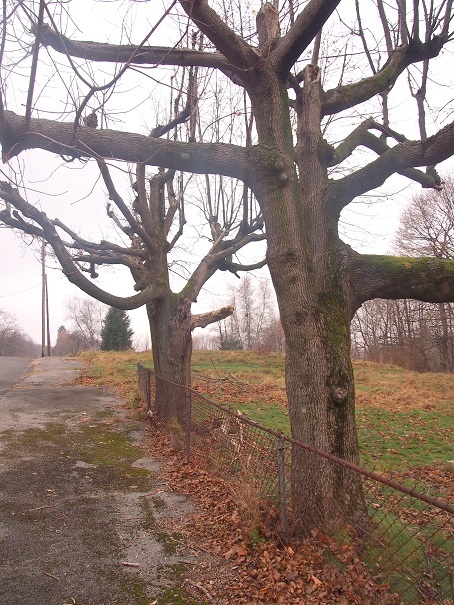 From these landmarks you can walk to an abandoned section of Route 61. There you’ll find one of the signature Centralia sites, and probably the most dramatic evidence of the fire. 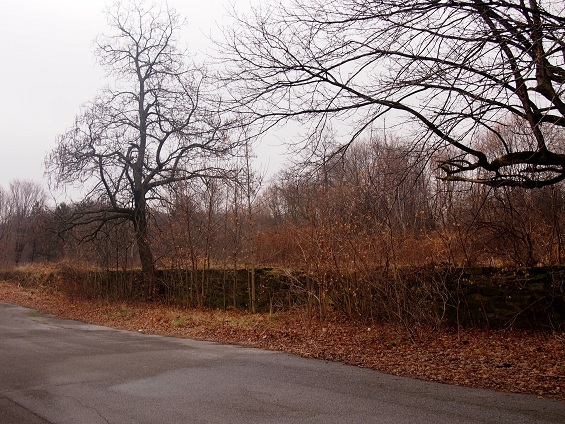 Just head out from the southeast corner of St. Ignatius, the larger of the two cemeteries, and you’ll run into the old road, which you can follow for less than half a mile to a giant [comma] smoking crack in the asphalt. But I’m not telling you that from experience. 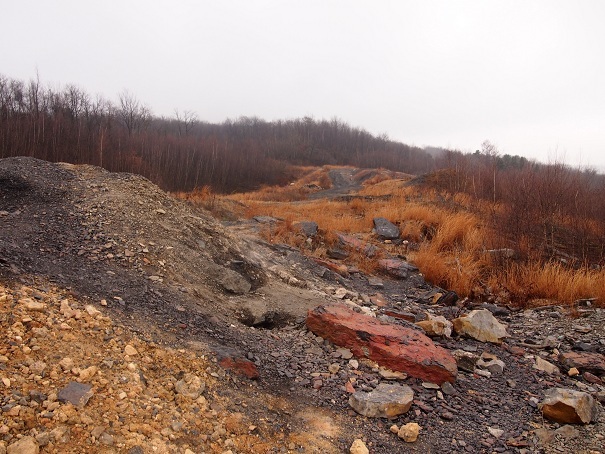 The way I arrived at the fissure last time and this time is by simply getting back in my car and heading south on the current Route 61 about a mile to where it intersects with the other end of the abandoned route. It’s a lot easier than I’m explaining it. 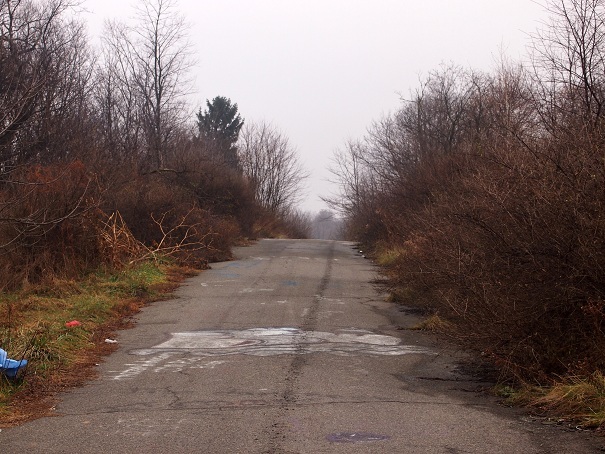 Just look at Centralia on Google Maps and it’ll show you the abandoned stretch of road that starts at the south end of the town. It’s less than a mile long, and Google Maps calls it Pennsylvania 61 Destroyed. It’s the name of the album Bob Dylan should have written. Of course, that said, I actually missed the other end of it a couple of times this time around. Five years ago, where they met was pretty obvious. A large four-foot-tall dam of dirt just off the road blocked vehicular entry, and a warning sign said horrible things about your future health if you continued exploring. Today that sign is gone, and the road now curves away from the abandoned stretch. To find it now, just look for the sharp curve marked by about half a dozen orange signs with black arrows. At the end of that curve is a small entrance you can drive through if you don’t care too much about the undercarriage of your car. After a few feet it stops at a flat bit of asphalt where you can park. That’s where the dirt mound is, and that’s where old route 61 is. From there it was less than half a mile walk across perversely graffitied asphalt. When my daughter asked, I had to tell her that the cylindrical shapes she kept seeing joyfully painted on the road were caterpillars. Hopefully, that doesn’t ruin her life. Besides the fact that it had been turned into a perverse canvas, you could tell that the roadway was abandoned by the way it undulated, rising and falling and breaking here and there as if an earthquake had snapped it like a whip. However, before we made it to the bend in the road that hides the crevice, we heard the terrifying sound of motors behind us. On an abandoned road. With only our three-year-old and the half-melted 3 Musketeers bar between us for protection, we jumped to the shoulder, and a group of about a dozen dirt bikers flew by us like we were in some kind of post-apocalyptic movie. In my imagination—fired as it was by ghost towns and, well, fire—they played the part of the roving band of outlaws on this disaster-torn earth and we were the innocent family who gets destroyed at the beginning just to show how horrible the villains are. They sped past us in the direction of the crack using the wavy sections of asphalt as ramps and making black streaks across the bright graffiti. 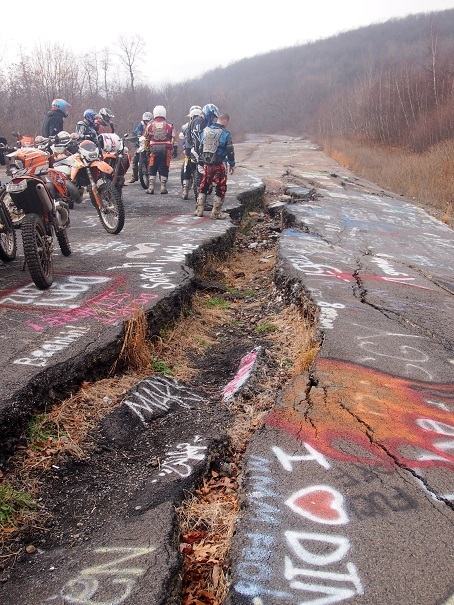 When we finally got there, they were all just hanging out, sweaty and helmet-less, their bikes angled on kickstands as they stared down in awe at the massive road damage. Far from wheeled marauders, they were some nice blokes, offering to get out of our way so that we could take pictures of the crack, even talking with us about the whole weird situation. 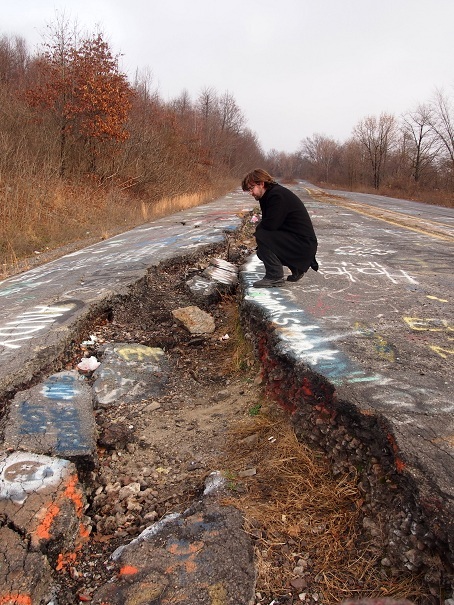 When you meet in a place like Centralia, you rightly assume you must be kindreds of one sort or another. One guy told us of a large sinkhole out in the woods behind the graveyards somewhere that seemed bottomless when you dropped things in it. The fissure wasn’t really smoking on this visit, but it was still impressive, sinuating itself a good 100 feet or so along the right lane, about two feet deep and five feet wide at its broadest. Disaster movies always make sure to show roads disintegrating in all the chaos of destruction. It’s a metaphor that means “no escape.” Disaster movies are deep, man. By the time the dirt bikers left, a group of young geocachers came by, who nicely offered us a can of spray paint to sign our names on the road. We didn’t. It’s not an OTIS article without at least one regret. 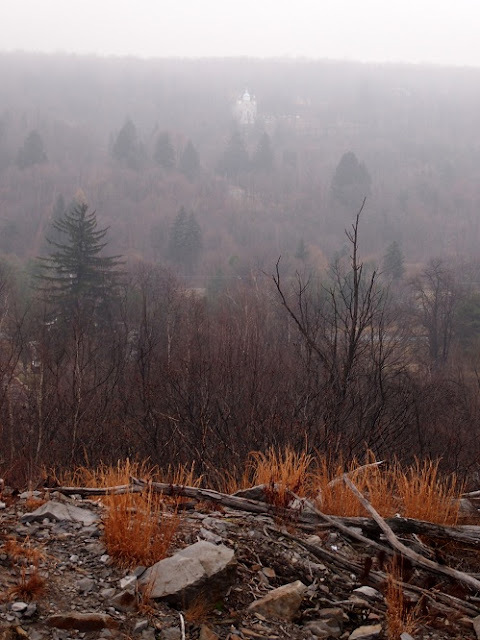 Instead, we somberly walked back the way we came, got into our car, and headed through the still-lingering fog around Centralia into the real world. 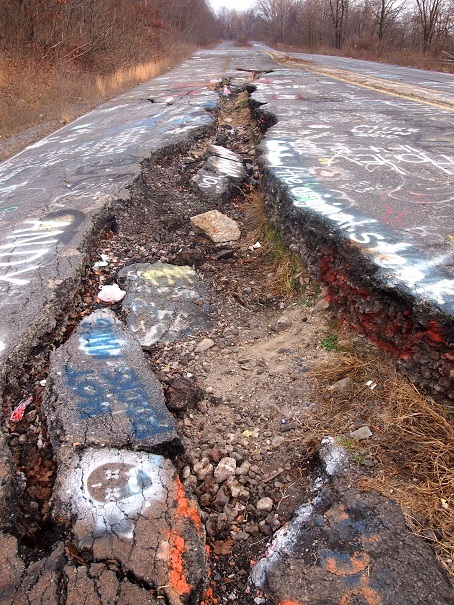 A lot of people, including myself, are slightly disappointed with their first experience in Centralia. But you know what? Now that I’ve visited it twice, I can tell you. It sticks with you. It really does.